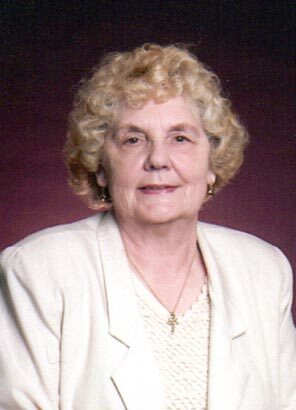 Ruth M. Goetz, 84, of Streator, passed away Tuesday Nov. 13, 2018 at Heritage Health in Streator. Funeral services for Ruth Goetz will be at 11 a.m. Saturday at the Elias Funeral Home. Pastor William Callister will officiate. Burial will follow in Hillcrest Memorial Park. Serving as pallbearers will be Greg Goetz, Matt Goetz, Scott Mandrell, Kele Mandrell, Justyn Johnson and Aaron Slater. A visitation will br from 9-11 a.m. Saturday at the funeral home. Born October 4, 1934 in Instaburg, East Prussia, she was the daughter of Alfried and Marianne (Demnler) Hempel, she married Ralph Goetz June 3, 1963 he passed away on August 7, 2002. She is survived by her daughter Mary Lou (Scott) Mandrell of Ancona, son Greg (Stephanie) Goetz of Streator, 10 grandchildren, 8 great grandchildren and a great-great grandchild due in December. She is also survived by sisters Renate Hempel, Gisela Beck ans several nieces and nephews. She is preceded in death by her husband, daughter Cindy Mc Closkey a great granddaughter and a brother. She worked at Owens Glass for over 40 years retiring in 1993, she was a member of St. Paul’s Lutheran Church in Streator. Ruth was a loving and caring person, she made everyone around her feel comfortable. She loved her children and grandchildren very much. Memorials may be directed to Alzheimer’s Association, Heritage Health or her church.